Meng Wanzhou must wear an ankle monitor and stay at home from 11 p.m. to 6 a.m.
Meng Wanzhou, Huawei's chief financial officer and the daughter of its founder, faces U.S. claims that she misled multinational banks about Iran-linked transactions, putting the banks at risk of violating U.S. sanctions. If a Canadian judge rules the case against Meng is strong enough, Canada's justice minister must next decide whether to extradite her to the United States. If so, Meng would face U.S. charges of conspiracy to defraud multiple financial institutions, with a maximum sentence of 30 years for each charge. US President Donald Trump told Reuters on Tuesday he would intervene in the U.S. Justice Department's case against Meng if it would serve national security interests or help close a trade deal with China. Speaking in Beijing, Chinese foreign ministry spokesman Lu Kang said Meng's arrest "was a mistake from the start". "Any person, especially if it is a leader of the United States, or a high-level figure, who is willing to make positive efforts to push this situation towards the correct direction, then that, of course, deserves to be well received." The Canadian government was considering issuing a similar warning, Canada's CTV network reported. Reuters was not able to confirm the report. The Chinese ministry spokesman, Lu, said he had nothing he could say on the details of the case, but said the ICG was not registered in China as a non-governmental organisation and Kovrig could have broken Chinese law. However, Guy Saint-Jacques, Canada's former ambassador to China, asked by the Canadian Broadcasting Corp whether the Kovrig detention was a coincidence, said: "In China there are no coincidences ... If they want to send you a message they will send you a message." Tuesday was the third day of bail hearings. 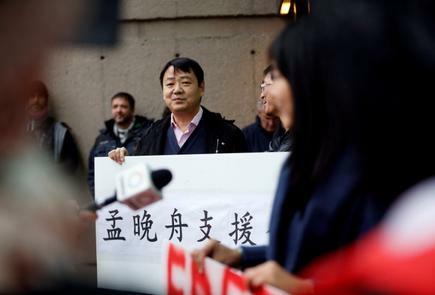 Meng's defence had argued that she was not a flight risk, citing her longstanding ties to Canada, properties she owns in Vancouver and fears for her health while incarcerated. Her family assured the court she would remain in Vancouver at one of her family houses in an affluent neighbourhood. Her husband said he plans to bring the couple's daughter to Vancouver to attend school, and Meng had said she would be grateful for the chance to read a novel after years of working hard. The case against Meng stems from a 2013 Reuters report about Huawei's close ties to Hong Kong-based Skycom Tech Co Ltd, which attempted to sell U.S. equipment to Iran despite U.S. and European Union bans.